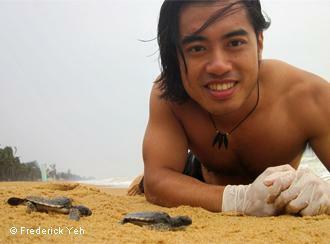 Frederick Yeh is an American-Chinese biomedical engineer who was driven into conservation work on a trip back to Hainan to visit family. He had happy memories of Hainan’s Sea Turtles from early childhood, but was shocked to discover that locals – who were hard up against the realities of a struggling fishing industry – were selling the turtles and no one was doing anything about it. Sea Turtles face threats like fishing nets, pollution and poaching. Frederick founded the organization Sea Turtles 911. 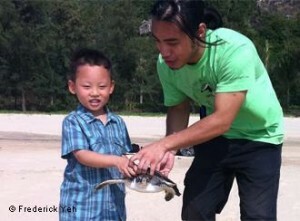 If you want to know more about Frederick’s work, you can visit seaturtles.org.